CASHIER, MISTAKEN FOR BANDIT IS SHOT BY BANK WATCHMAN! Howard M. Hayes, Grenola, Kas., Killed After Responding to Burglar Alarm; Men in High-Power Car Cause Suspicion. WINFIELD, Kas., Dec. 27, 1921.-Howard M. Hayes, 27 years old, cashier of the Grenola, Kas., State bank, was shot to death early Tuesday by Lou Downs, night watchman of the bank, who mistook Hayes for a robber. Hayes had been summoned by the watchman to investigate a report the bank was about to be robbed by bandits. The watchman saw a high-powered motor car stop in front of the bank Tuesday morning. He called the cashier by phone as one man from the car went upstairs to a hotel office and the others waited In the street. Hayes called Deputy Sheriff Harry Berry and Councilman Fred Marshall and the three went to aid the watchman. After Hayes was shot as he was entering the building, he was placed on a train bound for Winfield, but died before the train reached here. The body was taken back to Grenola on the next train. Hayes was not married. His father, E. M. Hayes. lives at Glasgow, Mo. For more information on Grenola History See Story before. On last Friday evening about 9:00 o'clock, just as most of the citizens were preparing to retire, the appalling cry of "fire" sounded out on the still air of night. The fire was discovered to be in the back part of W.E. Harvey's meat market, and as soon as the alarm was given, several men, who had not yet gone home, responded to the cry and rushed to the flaming building. The alarm soon spread and men, women, and children from all parts of town were soon on Main Street attracted by the bright flames which shot straight up nearly a hundred feet. The meat market and nearly every other place of business was closed but the door was burst open and then the flames came rushing through so hot that no one could face them. Work at once began to subdue the flames while part of the crowd went to work at once getting the goods and moveable property out of the offices and rooms adjourning. The buildings burned were all of wood. Commencing on the north, next to Darling's Hardware was Harvey's Meat Market, where the fire is said to have begun: then an empty building where the Smith stock of groceries, lately taken by an attachment, were stored, which building also belonged to Harvey. Next to this was a small building belonging to D.M. Reid and occupied by O.C. Shackelford with books and notions, next D.M. Reid's real estate office, then J.D. Pugh's drug store and Wells' barber shop. And last Joel Jackson's building occupied by J.L. Sollers with billiards and pool tables. All of the buildings were one story frame erected when the town first started, and occupied until the owners could build better. As was before stated the tike was first discovered in the rear of Harvey's meat market, and had made such headway that it was impossible to tell just where or how it originated. The fire soon enveloped this and the adjoining building and then, despite all effort, marched steadily on to the south sweeping everything before it. Water was hard to obtain in sufficient quantifies to do any execution, although men and ú number of women too, worked with might and main with pails to check the onward progress of the destroying element. The buildings were very dry and took fire before the flames came in actual contact with them, and the heat drove those back who were trying to get near enough to throw water on the fire. It looked for a time as though our devoted little city was doomed, but fortunately there was no perceptible breeze which enabled work to be done on all sides. When the fire had communicated to the last building, the bank of Barnes, Brown, and Denton stood next and it is fortunately built of stone two stories high and almost fire proof, although it has wooden door and window frames. Men mounted this building, and although it was a very trying place, they succeeded in keeping the fire from getting a hold on it. A number of brave men also stationed themselves on the roof of Bowdon Bro's store and ware rooms, which were of shingles, and stood their grounds amid falling cinders and fire and battled manfully to save this Melding, although it stands within less than thirty feet of where one building was a sheet of fire. By the aid of wet blankets salt and plenty of water, the building was saved although it seemed as though it would surely go, and perhaps it would had not several daring individuals got some scantlings an pushed in the side of burning building next to it. When the fire became the hottest and it seemed doubtful that the bank could withstand the attack, Bowden Brothers began to remove their immense amount of dry goods and groceries and in ú short time, everything of value was out of the building. When the fire was finally subdued, the goods were put back in about as short a space of time. On the north the work was as desperate and dangerous. Men were on the roof of Darling's Hardware and it was only by dint of hardest fighting that it was saved as the fire got under the roof back of the iron cornice on the front causing it to have to be torn away in order to get at the fire with water. But finally, the fire began to diminish and everything was last under control. But less than an hour from the time it started, seven places of business were in ruins. J.L. Sollers who occupied Jackson's building with billiards and pool was damaged $50 to $75. E.E.Darling's building was badly damaged, the cornice being torn off, the roof unsoldered and a large plate glass in the front broken. The damage will probably reach over $1000. Insured. The damage to Bowden Bros.' Stock by carrying it out and in well probably reach $1000. Insured. Everyone worked with a will and many brave acts were performed but more might have been accomplished had there been any trained organization on the ground. All seemed to be free from excitement but the work lacked direction or united effort with each individual doing what he thought best. This should be a warning and some effort should he put forth toward getting some sort of protection against fire, if it is nothing but a bucket brigade. Also let us have no more wooden buildings in the business portion of the town. The Grenola Leader, June 17, 1909 is about a fire that burned most of the frame buildings on the East side of Main Street from where the Senior Citizen Building now stands to the stone hotel at the south end of the block. Some of the people in the story were living back in the 1940’s and 50’s. You may recognize some of the names. According to family stories the fire started when a skillet of grease caught fire at the restaurant. B.H. Logsdon and his wife were some of the settlers from Hart County, Kentucky. B.H. was known as Bethel and his wife was Sally Self, a sister to Betty Sweet, Jim and John’s grandmother. Their parent’s George W. and Matilda Self lived here in Grenola at 202 North Main. Mr. Logsdon passed on at an early age, after leaving Grenola, but Sally lived to a good old age and often came back from Oklahoma to visit the Logsdon and the Sweet families. Many of you have memories of Aunt Sally, who smoked a pipe. Look under Self for her picture. The little city of Grenola was visited by the worst blaze last Sunday in the history of the town when the entire block from Logsdon’s restaurant to the furniture store which is in the old stone hotel building, went up in smoke. The fire started in Logsdon’s restaurant about 12:20 P.M., it is thought, a smoke was seen issuing from the windows on the north side about 12:30. It is said that Mrs. Logsdon had gotten dinner over and had gone to her mother’s in the north part of town and left her husband alone in the restaurant and he closed the doors and was sitting out on the sidewalk. Syl Dixon, lives just back of the restaurant, saw smoke issuing from windows and ran around to the front and notified Logsdon and then gave a general alarm. Logsdon went in and threw out some popcases and got a trunk full of clothes, which was all that was taken out. Everyone who heard the alarm of course, headed for that place and some thought they could have put the fire out but say the proprietor told them then it was too far gone and to help others save their stuff. Well, there was nothing to do but to get busy and they did. Some however went up the stair way and thought to save Mr. Flood’s things in the front room but say the smoke was too thick for them. All hands went to work saving Harry Miller’s jewelry stock and soon had it in safety, also Jim Lott’s barber shop and in fact all along the line while others tried to tear out the small buildings and even tried to blow them out with dynamite but the fire got too hot and they had to abandon their job and go further up the line and when they got to Dr. Archer’s building they tore it down and stopped the fire at Mrs. Williams building, thus completely burning and wrecking everything to the stone building. The Jennie Stark Building, occupied by B.H. Logsdon’s restaurant, building and contents, except for a few pop boxes, entirely consumed. Building insured for $400, stock and fixtures $800. F.B Flood, wife and daughter who were rooming in this building were down on the creek, having taken their lunch and wearing their old everyday clothes and they lost everything they had except what they had on. They lost four or five big trunks of clothing, wardrobes, wigs, papers, scrip, makeup, some money, jewelry, some fine diamonds and many things that cannot be replaced at all, valued in all about $1,500, with no insurance. They Flood family says this is the firs time they have happened to such bad luck in all their travels. Dr. Mason’s building, occupied by Jim Lott, barber and Harry Miller Jeweler. Lott removed everything of any note, even to his linoleum. Miller removed everything of any consequence. Building insured for $300, barber fixtures insured for $150. Linderman no insurance saved almost everything. Dr. O’Conner’s office building occupied by himself. Building insured for $300, contents insured for $100. Almost everything taken out but damaged. Downs Building occupied by W.F. Wyrick, tailor-made clothier and Demmitt & Crowther cream and produce. Building a total loss, no insurance. Demmitt & Crowther stock insured for $200 but saved almost everything. Wyrick saved his goods. Mrs Williams building occupied by stock of goods below and residence above. Building insured for $100, stock for $1,500. Quite a lot of goods were carried from the store and most of her household goods were taken out. She will be quite a looser. Dr. Archer’s building occupied by himself and an office and E.B. Place as a real estate office, Building and the Dr.’s goods insured for $1000, almost everything removed from this office. Mr. Place had no insurance but got nearly everything out. The ladies are better to help in case of fire in Grenola than a great many men. We saw and so did many others where those large hooks and ropes which we tried to get the city to get, would have come in good play at this fire. Those small buildings could have been pulled out and much property saved. The ladders are all right but that pump has been pretty near a blank. Some say the pump is all right if it was fixed, perhaps so, the people would like to see it work at the next fire we have. Some people thought that the Daltons had struck town and was getting their cash out of the Bank when those big shots went off. The dynamite shots cracked some window glass on west side of Main Street, but none fell out. New brick buildings will replace the old frames, which will make Main Street, look considerably better. Clyde Hand got his pants tore during the rustle. The writer hung up by one leg while helping move a porch from the rear of the Wells building and Mr. Shaw had to lend a helping hand. Here was where a friend in need was a friend in deed. Lots of people from the country saw the smoke and heard the dynamite shots and came to see what was the trouble. Several strangers who were in town flew into the collar to do what they could to save property and goods. Those who were in the block that was burned last Sunday are about all located again, some permanent and others only temporary. Logsdon the restaurant man in not in business anywhere and will not likely start up again. Jim Lott the barber is up stairs over the furniture store in front room. Harry Miller the jeweler, is in the north part of the Building occupied by John Hunt’s hardware. Jack Linderman has moved out home. Dr. O’Conner is in California and nothing is yet known as to his location. J.F. Wyrick is in the building with John Hunt and Harry Miller. Demmitt and Crowther produce, rear of Mason & Son’s. Mrs. Williams has moved her things to the Smith house in rear of Munsey’s blacksmith shop. Dr. Archer has moved his office fixtures and medicines in the building with J.W. McLellan. In the spring of 1870, John James and Hugh Hart located a town site in the southwest part of Elk County, to which they gave the name of Canola, the site being upon land owned by John Reid and H. L. Corum, the original claimants. The first establishments were a general store belonging to the Hart brothers, and the post office which was located at this point in March, 1870, with John Reid as Postmaster. The town progressed slowly up to 1879, when its location was changed, at which time it contained several business houses and a population of one hundred, among whom there was but one woman, Mrs. Melvin by name. To the north of Canola a distance of about three miles stood the rival town of Greenfield. This place has been established since 1869, the post office being located there at that time, and Rev. Mr. Vickers held the commission of Postmaster. The site stood upon a claim belonging to A. A. Toby, but only a small space was laid off into town lots. The first business started in the place was a general store belonging to A. A. Toby. But little progress was made in the building of the town, which never attained to much importance. The two towns thus stood rivals for some years, with Canola far in the advance. Upon the completion of the Kansas City., Lawrence & Southern Kansas Railroad through the south part of Elk County, the two places became united, the railroad having passed between them at an almost equal distance from each. Both towns were thus left apart from the advantages of the railroad, which they were anxious to secure. The consequence of this state of affairs was their consolidation, which took place on the 7th day of July, 1879. The survey of the new site was made by a man by the name of Ross, on land purchased from W. H. Guy by the Town Site Company, composed of citizens of the town. Originally the claim had been taken by Silas Gibson, who afterward sold out to C. Maris. who disposed of the same to Guy. At its formation the company numbered twenty shares of $20 each, and Thomas Hawkins was President; D. M. Reid, Secretary, and W. H. Guy, Treasurer. The number of shares have since been increased to one hundred, and as an index of the prosperity and prospects of the town, the shares have sold at a premium of twenty-five per cent since the establishment of the town site. The town being formed as before detailed, from the union of the towns of Canola and Greenfield, owing to the simultaneous removal of business houses from each of these, its upbuilding was extremely sudden. The earliest business house, however. that was started in the town was a general store belonging to Browder Brothers, in the room now occupied by J. N. Aubushon's drug store. The next was a grocery, owned by George Lee. There was, however, but a short time between the establishment of these, and others followed in rapid and almost unbroken succession. The town, with a population of about seven hundred, contains three general stores, two groceries, one furniture, two drug, two millinery and two hardware stores, two hotels, three billiard halls, two restaurants, two blacksmith and two wagon shops, one saddlery shop, two livery barns and one lumber and coal yard. During the building of the railroad in the fall of 1879, the town was pervaded with an atmosphere of ruffianism that bordered closely upon outlawry. At that time the place contained several saloons, and the intoxicating beverage found ready sale to the construction hands, and drunkenness ran riot through the streets; so much so. indeed, that in walking on the streets in the night time one was sure to stumble over the prostrate forms of half a score or more men in a beastly state of intoxication. Quarrels and fighting were common, but only one death occurred amidst all this disorder and confusion, and that accidental, resulting from intoxication, and is the first to head the death record of the town. It was that of H. R. Jackson, a construction hand, and occurred in the spring of 1880; Jackson, it appears, had been drinking freely, and on going home in the darkness fell through a trestle on the railroad, receiving injuries from which he soon afterward died. The first child born in the town was Grenola Lee, daughter of George and Mrs. R. A. Lee. Being the first child born in the town and having the same name, the town company honored her by deeding to her in fee simple one of the best lots in the place. Grenola became incorporated as a city of the third class in the fall of 1880, the incorporation being hastened from differences arising between the temperance and anti-temperance elements. The first officers elected for the government of the new city were J. C. W. Crider, Mayor; J. L. Barnes, Treasurer; M. W. Williams, Clerk; C. A. Kelso, Police Judge; W. Hatchett, Marshal; William Dory, J. N. Aubushon, J. A. Weston, L. H. Smith and A. S. Browden, Councilmen. The city at present is under the official management of Neil Shaffer, as Mayor; T. W. Hilton, Clerk; M. Hoyt, Police Judge; D. M. Reid, Treasurer; John Burden, Marshal; William Dory, John Pugh, George Stanwood and John Hank, Councilmen. The Grenola Post Office was established August 1, 1879. Both Canola and Greenfield had been points for the distribution of mail matter, but when the towns consolidated both these were abandoned and Grenola was made its location, with D. M. Reid as Postmaster, who has since that time been retained in that capacity. The school district of which the town of Grenola forms a part, is formed from parts of Districts 21, 22 and 23. The first school was taught by John D. Simpson and B. F. Weeks, and was kept in the building erected for school purposes. The house is a one-story stone, consisting of two apartments. The first school numbered an enrollment of 110 and has increased to 200. The school is graded, forming the intermediate and primary divisions. D. J. BISHOP, farmer, P. O. Grenola, was born in Ross County, Ohio, in 1833, where he was raised, living there until 1861, when he enlisted in the Sixty-third Ohio Infantry, Company B, serving fourteen months. In 1863, he joined the National Guards and was out 100 days, and was home but two months from that time, when he was drafted and reported at Columbus, Ohio. He was put on detached duty, taking substitutes to the front in South Carolina, North Carolina, Tennessee and New York. Coming out of the army, he returned to Ross County and remained there until 1871, when he came to Kansas, locating at Humboldt; soon after went to Neodesha, Wilson County, and was there eighteen months, and thence to Howard County and took a claim on Section 4, Township 31, Range 9. He was seventy-fire miles from market, and there were no improvements near his claim. He has 140 acres under cultivation, the farm all fenced, and two acres of fruit and other improvement'. Has about 400 fruit trees, 200 of which are very fine peach trees, and also has a large variety of small fruits. He was Justice of the Peace four years, and is one of the leading men of the town. He was married, in 1869, to Miss Maggie Ware, of Pike County, Ohio. They have four children - Elener E., Willis K., Percy D. and Charley M. He is a member of Grenola Lodge, No. 86, A. O. U. W., and Chillicothe Lodge, No. 83, I. O. O. F.
I. N. CAMPBELL, farmer, P. O. Grenola, was born in Kane County, Ill., in 1850, and was raised there. In 1868, emigrated to Kansas and located in Labette County. At the end of two and one-half years, located in Howard county, and located a claim on Section 36, Town 31, Range, 9, then about seventy miles from a railroad. He at once proceeded to make a farm, and has added to the original claim, and now has 720 acres of land, 340 of which is under cultivation. Has the whole place under fence, seven miles of hedge, fifteen acres of orchard, barn 32x36, three good houses and plenty of running water, besides several fine springs, timber and everything to be desired on a farm; is very extensively engaged in stock-raising, has 142 head of stock; also buys and ships considerable stock, and handles a great many hogs. Is one of the best stock men in the county and has been very successful. Was married, in 1876, in Elk County, Kan., to Miss E. A. Walworth. Mr. Campbell is a genial gentleman, and very popular in the county. E. G. DEWEY, wool-grower, P. O. Grenola, was born in Berkshire County, Mass., in 1842. Was raised in Lagrange County, Ind., until nine years of age, and in Ogle County, Ill., from the age of nine until 1860, when he emigrated to Jefferson county, Mo., and was there four years. During his stay in Missouri he served in the enrolled militia of that State. In 1864, he returned to Illinois, locating in Marion County, and engaged in fruit-raising and teaching. In 1871, he came to Kansas and located a claim on Section 26, Town 30, Range 9, and made the first claim in this part of the town. He then returned to Missouri, and took a course at the Missouri State Normal School at Kirksville, finishing in 1873. Was principal of the Salem, Ill, graded and high school in 1874-75. He than remained the most of each year teaching, until 1875, and engaged in sleep raising; the following year, he was elected Superintendent of Public Instruction for a term of two years; in 1877, 1878, 1879-80, he was Principal of the Elk Falls schools, and, in 1881, was Principal of the Howard schools; since then, he has devoted his attention strictly to his sheep. He has 100 acres of his claim under cultivation, planted two miles of hedge, put up a good house, planted a good orchard, and has sheep sheds, etc. He has 700 head of high grade of merino sleep, which he has graded from coarse wool sheep. He has been very successful in his business, his investment paying about 45 per cent per annum. He has eighty per cent of the increase, and the average clip has been six pounds. He also does something in raising cattle. He was married, in 1878, to Miss Jennie Robb, of Elk County. They have one son Ralph E.
A. G. DILLEY, farmer, P. O. Grenola, was born in Lake County, Ind., in 1840, and was raised there until twenty years of age. In 1861, he enlisted in the Ninth Indiana Infantry, serving four years and three months. After coming out of the army, he engaged in the mercantile business until 1871, when he emigrated to Kansas and took a claim in Howard County (now Elk) on Section 25, Town 30, Range 8; was eighty-five miles from a railroad point, where he had to go for all supplies. His claim is watered by the Big Caney River; has added 200 acres, and now has a farm of 360 acres, with eighty acres under cultivation, eighty acres fenced, fifteen acres of timber, good orchard and small fruits, etc. Is raising sheep, starting in 1880 with thirteen, which he increased to 220 in two years, yielding from seven to eight pounds of wool per head, and paying thirty-five per cent, the increase saved being eighty-five per cent. Is also raising some fine short horn Durham cattle. Mr. Dilley is one of the enterprising men of the county and a good farmer. Was married, in 1868, to Miss M. L Wheeler, of Rome, N. Y.; they have two children - Willam A. and Eva A. Mr. and Mrs. Dilley are members of the M. E. church. WILLIAM DORY, stock-dealer, was born in Allegany County, N. Y., in 1837, but was raised in Leighton County. In 1863, enlisted in the One Hundred and Eighty-eighth New York Volunteer Infantry, serving until the close of the war. In 1876, emigrated to Michigan, locating near Grand Rapids, and engaged in farming, remaining there until 1870, when he lost heavily through the failure of Gardner & Armistage, and then emigrated to Kansas, locating in Howard County (now Elk). The survey was not made, and for the first six months had his time with the survey party, then took a claim on Section 6, Town 31, Range 9, on the Big Caney River; was ninety miles from market.. He has added 100 acres to the claim, making a place of 260 acres, situate (sic) one and a half miles north of Grenola, with 100 acres under cultivation twenty acres of timber on the river, making a fine place for stock. The place is all hedged, with an orchard of 400 apple trees, 2,000 peach trees, and a large variety of small fruits. Is raising and feeding 250 head of cattle per year, and since 1876, has been buying and shipping a great many cattle; also has stock in the Grenola Town Company, and has been a Director in the company all the time since. Has put up several fine buildings in Grenola and a good ice-house twenty-two feet square, and is furnishing ice to the town. Has a fine residence on his farm; and in town. Was married, in l858, at Hornellsville, N. Y., to Miss Clark They have one son - William, Jr., who has charge of the stock farm. Mr. Dory is one of the best business men in the place, and a genial gentleman. CHARLES B. FUQUA, farmer, P. O. Grenola, was born in Hart County, Ky., in 1837, and was raised there until sixteen years of age, going from there to Knox County, Ill. In 1854, emigrated to Jasper county, Iowa, remaining there six years. In 1861, went to Utah, remaining there one year, thence to Nevada, and then to California, and in the spring of 1863, went to Oregon, remaining there three years, enlisting in the First Oregon Infantry, serving nineteen months, mostly on the frontier. After coming out of the army, went to Washington Territory, remaining nearly two years, then for a year or two was traveling, and, finally, reaching Kansas in 1870, was one of the first settlers in Howard County, coming here before the county was surveyed, and took a claim on Section 5, Town 31, Range 9; has improved that and several other places in the county, and at last bought a place on Section 6, Town 31, Range 9. Has sixty-five acres improved, 160 apple trees, and 200 peach and other kinds of fruit, etc. The place is well watered by Caney River, with twenty acres of timber. Is raising a good many cattle, hogs and horses. The place is two miles from market. Was married in Greenfield Township, Elk County, Kan., June 26, 1870, to Miss Nancy A. Weeks, this being the first marriage in the township. They have five children - Roosa A., A. D., Thomas T., Robert F. and Martha A.
E. HAIGLER, farmer, P. O. Grenola, was born in Virginia in 1824; in 1830, his parents settled in Ohio, remaining there about ten years, and thence to Iowa. In 1857, he emigrated to Kansas, locating in Calhoun County, and was among the earliest settlers in the county, and put up the first saw-mill in the county. At the end of two years, located in Miami County. At the end of two years, settled in Coffey County. While there, in 1861, he enlisted is the Second Kansas Infantry, serving six months. He then returned to Miami County, and was there five years. In 1871, he located a claim in Howard County (now Elk) just after the survey was made. His claim is on Section 35, Township 31, Range 9; was seventy miles from a railroad when he took his claim. He has well improved the place, which contains 160 acres, all under cultivation, excepting twenty-one acres of pasture, all fenced, and he has planted a fine orchard of seventeen acres, about the best in the county, and has all kinds of fruits. He takes great pride in his fruit-growing, and besides the common fruits has a few specialties, among which will be found whortleberries. His peach and apple crops are very large. In 1841, he was married in Washington County, Iowa, to Miss Gwin, of that place. They have six children - Mary, Smiley, lsabelle, Erastus, Laura and Clara. THOMAS P. HAWKEN, farmer and stock-raiser, P. O. Grenola, was born in Logan County, Ohio, in 1844. In 1863, he enlisted in the Thirty-third Indiana Volunteer Infantry, serving until August, 1865. He was wounded at the battle of Peach Tree Creek in 1864. 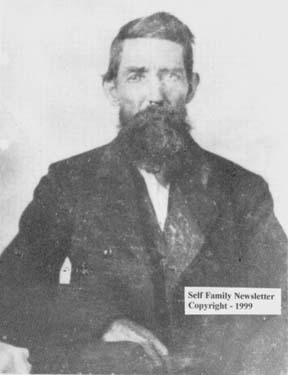 In 1869, he emigrated to Kansas, locating in Woodson County, remaining there for one year, thence to Howard County (now Elk), and took a claim on Section 31, Town 31, Range 9; was eighty miles from market, his place lying on the Caney River, he being one of the first settlers there. He has added 260 acres to his original claim of 160 acres, which he has converted into a stock farm. Has plenty of running water and sixty acres of timber, making a fine shelter for his stock. Has 200 acres under the plow and 320 acres fenced. Has a good orchard of 300 apple trees, 1,000 peach and a variety of small fruits. He is extensively engaged in stock-raising and feeding, handling about 100 head per annum. In 1879, he became one of the stockholders in the Grenola Town Company, and was elected the first President, and is one of the Directors at present. He was Chairman of the Township Railroad Committee which secured the railroad through the township. When Howard county was divided, he was appointed the first Clerk of Elk County. In 1873, was Township Trustee of Greenfield. He was married, in 1866, to Miss Brownly, of Logan County, Ohio. They have five children - Alice, S. E., W. R., Bertie M., Dora E. He is a member of the E. M. Stanton Post, No. 23, G. A. R., of Howard. LIEUT. MATHIAS HOYT, was born near Newark, Ohio, May 17, 1844, where he was raised until seventeen years of age, when he went to Woodford County, Ill., where he enlisted in the Twenty-sixth Illinois Volunteer Infantry. Served three years and six months. Enlisted as a private soldier and was discharged as Second Lieutenant of Company K. Was with Sherman in his march to the sea. Was in command of foraging party through North and South Carolina. Was surrounded by guerrillas and barely escaped with his life, seven of his men being hung to trees by the roadside. Was in command of Company K, Twenty-sixth Illinois, at battle of Bentonville, North Carolina; his company was first to cross the bridge at Bentonville, North Carolina, under a storm of grape and canister, which caused a loss of one-third of his company. N. F. JENNE, farmer, P. O. Grenola, was born in Vermont in 1832. When twelve years of age he emigrated to Eaton County, Mich., being one of the early settlers in that County. In 1861, he enlisted in the Second Michigan cavalry, serving three years and a half; was captured near Chattanooga in 1863, and was a prisoner of war for seventeen months, being six months in Andersonville prison. After coming out of the army he remained in Eaton County until 1871, when he emigrated to Kansas, locating in Elk county (then Howard), and took a claim on Section 18, Township 3l, Range 9, the place being watered by Caney Creek. He has sixty-fire acres under cultivation, with a fine orchard, with all kinds of fruits. He has fifteen acres of timber which affords good shelter for stock. He has about 200 head of sheep of good a grade of Merino, the yield being about seven pounds per head, the investment paying from thirty-five to forty per cent. He has served as Treasurer of the Town of Greefield (sic) for two terms, and is one of the best citizens in the township. He was married in 1851, at Eaton Rapids, Michigan, to Miss Mary Taylor, of that place. They have one daughter - J. C. They are members of the Methodist Episcopal Church. C. A. KELSO, merchant, was born in Morgan county, Indiana, 1834. Learned the carpenter trade, and remained there until 1856, going from there to Illinois, where he followed his trade and bridge building; in 1860, returned to his old home in Morgan County, and engaged in building there until 1861, when he raised Company G, of the Twenty-seventh Indiana Volunteer Infantry, but would not accept a commission, but served as Orderly Sergeant. Was on detailed duty the most of the time, and made out all the rolls, and was in command of the company during several battles. Was taken prisoner once, and received two wounds, and after serving three years, returned to Indiana, and in the fall of 1865, emigrated to Boone County, Iowa. Was elected Justice of the Peace in Hendricks Township the fall of 1866, and served until he came to Kansas, and first located in Labette County, where he followed his business of building in 1867 and 1868. Built the dam and mill at Oswego, 32x40, put in the machinery, and had charge of it four months; in 1869, located in Howard County, in what is now known as Belleville Township, Chautauqua County, on the Big Caney River. Was the pioneer of that part of the county; was twenty-five miles from any other settlers, and about eighty miles from a railroad point. There were several hundred Indians camping on the river near him when he settled there. His place was in Sections 7 and 8, although at the time of settling there the surrey had not been made. The place was well adapted for stock-raising, there being nearly 100 acres of timber on the creek. He put up a log cabin, and for over a year Sunday school was held there every Sunday, it being the only house which was large enough to accommodate the people. Mr. Kelso cleared twenty-five acres of timber and farmed the place; had 100 acres under cultivation; put out a fine orchard of peach and apple trees; put up stables, cribs and granary; good frame house, 22x30, and for ten years lived on the place, and was engaged in stock-raising to a large extent. Also did a large business in contracting and building, and his first work being Hart's mill, on the Caney River, in Chautauqua County, 24x50, forty-feet high - a large mill for the county at that time; put up the greater portion of the buildings in Oswego, the court house and several buildings in Sedalia, and in 1879, when the L. L. & G. Railroad was built through Elk County, came to Grenola, where he commenced contracting and building, putting up several of the first business houses and dwellings in November of 1879. Engaged in the hardware and implement trade, which he has followed since. Was Chairman of the Convention in 1870, to organize Howard County; served two terms as Trustee and Assessor of his township; was Chairman of the Caney Claim Club, which was organized before there were any officers in the county; and when the city of Grenola was organized, was elected the first Police Judge, serving from 1880, until May, 1882. Was married in 1852, to Miss Mary M. Thurston, of Shelby County, Indiana. They have seven living children - James N., Thomas E., Martha C., Willis D., Ulysses G., Mabelle and Charles L. Is a member of the G. A. R.; of Adams Lodge, No. 36, A., F. & A. M.; Oswego Lodge, No. 63, I. O. O. F.; Grenola Lodge, No. 80, A. O. U. W., and of the Missionary Baptist Church, and was licensed in 1873 to preach, and had two charges in the County. R. U. LAWYER, farmer, P. O. Grenola, was born in Muskingum County, Ohio, in 1844. In 1855, he went to Illinois and was raised in Tazewell County, living there until the fall of 1869, when he located in Bates County, Mo., and at the end of one year, located on a claim in Howard County, Kan., on Section 30, Township 30, Range 9, and was among the first settlers in that part of the township. He was at the organization of the county, and was elected the first Trustee of Greenfield Township. The following year he was elected Justice of the Peace and held the office continuously for seven years. Again in 1883, was elected Trustee of the township. When he first settled in Kansas, he was eighty miles from a railroad. He has improved his farm, which consists of 137 acres, all under cultivation but ten acres, all fenced, and has planted twelve acres of orchard, put up two houses on the farm and other buildings. He has been in the sheep-raising business for some time. He was married in Bates County, Mo., in 1871, to Miss Nellic Gardner. They have three children - May, Jane E. and Ada. He is a member of Meridian Lodge, No. 126, A., F. & A. M.
C. P. LEE, farmer, P. O. Grenola, was born in Essex County, N. Y., in 1844. In March, 1864, he enlisted in. the Tenth New York Heavy Artillery and served eighteen months. In 1870, he emigrated to Kansas, locating in Howard county and took a claim on Section 9, Township 31, Range 9, on a branch of Caney River. 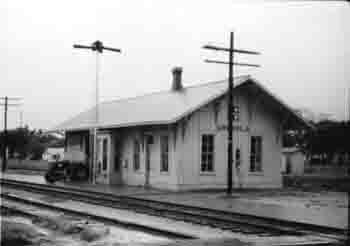 Humboldt was the nearest railroad point, a distance of nearly eighty-five miles. The following year, his mother came West and located a claim adjoining her son's, and these two places he had improved. He has 100 acres under cultivation, the most of the place is under fence; he has planted three acres of timber and a good orchard, put up a good frame house, 18x22, and a wing 12x30 feet, drawing the lumber eighty- five miles. He has plenty of running water and good springs on the place, making a very desirable stock farm. Mr. Lee has been in the stock business the most of the time since he has been here. He owns mining stock in several Colorado mines. He has done well here, having made the most of his property since he came. He is one of the substantial farmers of his town and a man highly respected. He has served as Clerk of Greenfield Township two terms. Was burnt out by a prairie fire April, 1873. Horses, hogs, farming implements, house and contents were destroyed. J. H. LEE, merchant, was born in Marion County, Ind., in 1825, and lived there and in Missouri until 1864, when he emigrated to Kansas, locating in Coffey County, where he took a claim. Was one of the pioneers of this county and had to go 100 miles to market and paid 10 cents per pound for flour, $5 per hundred-weight for corn meal and $10 per barrel for salt. Saw hard limes, as he had little to do with, but finally began stock-raising, in which he did a large business. In 1875, he settled in Grouse Creek, Cowley Co., where he was extensively engaged in farming and stock dealing. In the spring of 1882, he came to Grenola, and with his son engaged in the grocery business. His son went out soon after, and he is now in company with Mr. Brown. He is also dealing in stock; has 100 head of cattle and also does some business in buying and shipping stock; also owns a fine farm of 160 acres one mile east of Grenola, with eighty acres under the plow, good buildings and fine orchard of apple and peach trees. Was married, in 1844, to Miss Newbury, of Missouri. They have three children, viz., Sarah, Emma and George. Mr. Lee is a member of the Masonic order. CHARLES LIEBAN, wool grower, P. O. Grenola, was born in Germany, in 1835, and emigrated to America in 1851. Located at Philadelphia and learned the wheelwright's trade. In 1857, he emigrated to St. Louis, Mo., where he remained two years; from thence to Lexington, Mo., where he remained until the outbreak of the war in 1861; thence to Fort Leavenworth, Kan. In 1864, he went to the mountains; stayed there four years, when he returned to Leroy, Coffey Co., Kan. In 1870, he came to Elk County, then Howard, and took a claim on Section 1, Township 31, Range 8, nicely watered by two branches of Caney Creek. He was fifty miles from market, and had to go that distance for all their supplies. Flour was worth from $5 to $6 per hundred-weight, bacon 25 cents per pound and times were hard, but the subject of this sketch was not discouraged, but went to work with a will and has been well rewarded for his labors. He and his youngest brother, Frederick, own 420 acres of fine land, thirty acres being timber, 120 acres under cultivation and 260 acres fenced, and is but three and a half miles from market. He has planted a fine orchard and put up good buildings; he has 700 head of sheep. He started in 1876 with 160 common sleep, and has improved them until he has a high grade of merinos, yielding nine pounds per head, also raises other stock, but makes a specialty of sheep. His brother Frederick has been with him since 1871. He was born in 1852 and came to Kansas in 1868. He was married in 1883 to Miss Rachel Ingram. Jeff Duree was born on July 22, 1893 in Bartlesville, Oklahoma one of thirteen children born to Miles and Margaret Duree.. In 1913, he was arrested and convicted for horse theft and served a year at Oklahoma’s Granite Reformator. Soon after his release, he and his brother, Dan operated a pool hall in Daugherty, Ok that became the headquarters of a burglary ring, which included names later to be known as the “Ma” Barker Gang. How did he become involved in the Grenola area? He never robbed a bank here. In 1920, he married Hattie Downs McKain, on the Downs farm, seven miles south of Grenola. He spent time in this retreat when not busy elsewhere. In 1921,he was charged with robbing a Mail train near Edmund, Oklahoma. He, his brother, Dan, and two others were sentenced to 25 years in Leavenworth Federal Penitentiary. Jeff served one year, then with an alibi that he had been robbing a bank in Nebraska at the time, he was released on a $10,000 bond to appeal his case. From then on until 1925, he kept busy robbing banks in such places as Catoosa, Maramec, Lamont, Bristow, Sparks, and Hoffman in Oklahoma and Peru, Hepler, Conway, Whitewater, in Kansas. He was called the “Phantom Robber” because of his methods. He usually had a gang of four or five, including some of his brothers. They arrived in a town in the wee hours of the morning, when the night watchman had probably gone to sleep. They would take an old car, remove the pack part and put a winch in it. They opened the bank door with a screwdriver and a metal cooking spatula, then hooked the winch cable to the safe, pulled it out the door and into the back of the car. They sped off to a remote area and under the cover of an old barn or a tent, they counted the money. Bankers, oilmen, and jewelers in Tulsa, Sapulpa, and Claremore, Oklahoma were involved with the financial handling of the gang’s loot. A wealthy oilman and his son in Salpulpa, Ok, a Doctor who was a sanitarium manager in one of these cities were eventually arrested for their activities as bondsmen and “fence” for the gang’s operations. In 1924, Jeff Duree tried to return to the farm to spend some time with his family, but warrants for his arrest were widespread. He was wanted for suspected robberies listed above as well as for jumping bond on the Edmund train robbery. On August Saturday, August 2,1924. Jeff Duree drove his wife in to Grenola to shop or visit relatives in his blue Packard. He had no sooner parked at the curb and stepped from the car, when Grenola City Marshall, Frank Hazlett, arrested him. Duree went quietly, but inside a house he managed to get the upper hand and escaped. Later that week, Jeff and his brother Charles returned to the farm, and picked up his brother-in-law. The three of them went to a place on the Gus Reed farm one half mile south of the picnic grounds in Cloverdale and hid in a cave on the Caney River. My father, Golde Fisher told me that he was a teen-ager at the time was scouting around, came upon the gang and they hired him to go to the Cloverdale Grocery Store to buy food for them. A few days later someone north of Grenola reported seeing the blue Packard drive by with Jeff and Charles Duree in it. Then a short time later someone called in that they had seen the car speeding by south of town. Marshall Hazlett immediately summoned officials in Elk and Chautauqua counties. He and banker G.H Coffey headed south out of town to join the Chautauqua County Sheriff , A.Y. Buckles, the Elk County Sheriff, George A. Murphy, the Elk county attorney, G.A. Sharp and the Cedar Vale Marshall, Lloyd Casebolt. .Buckles deputized several others so that they had a posse of about 50, including my Dad’s father, Ceal Fisher. On Thursday, August 7 the posse surrounded the hide out and started deliberations, when someone fired a shot. Then all hell broke loose. When the smoke had cleared one of the outlaws was dead from a bullet that went into an eye and through the head, one wounded in the hand, and one got away. The person who got away was believed to be Charles Duree, the one killed was believed to be Jeff Duree and the one shot was Glenn Downs who was not believed to have been involved in any crimes. Glenn was arrested and taken to Sedan. The body was also taken to Sedan in the blue Packard and identified by some of the lawmen and bank officials as that of Jeff Duree. Finally, Glenn Downs was asked to identify the body. He said that he did not believe that it was Jeff Duree. After being questioned by the Sheriff and county attorney he was released on Tuesday and returned home. The Duree family was called to identify the body of their son. The father and other members claimed that the body was that of Charles Duree. They said they did not have money for the burial, but requested that he be buried in Sedan with a Christian burial. On Sunday the Reverend W.G. Hall of the Presbyterian church conducted at service at the grave with music being furnished by a quartette. So according to the Sedan Times Star, The body of Charles Duree was laid to rest in the Sedan Cemetery. Meanwhile, the other Duree brother made an exciting escape. Going to a neighboring farmhouse, he “borrowed” a car, drove it over the rough pastures and roads, finally driving it across the road and setting fire to it. Then he pulled his deputy Sheriff’s badge out of his pocket, put in on and managed to take another farmer’s car. He finally abandoned it in a cornfield and escaped on foot, following the railroad track. “Saturday morning after the battle some young men looked over the battlefield and Jay Logsdon picked up a burlap sack under some bushes. It contained about $180 in nickels and $30 or $40 in pennies. This seems to connect the Duree brothers with the robbery of the bank at Elbing, Kansas, Wednesday night where a large number of nickels were taken.” The Grenola Leader, August 14, 1924.
Who was killed in the battle at Cloverdale? Did the slaying of the ringleader of the outlaw gang put and end to their operations? More next week. The Grenola Museum and the Chautauqua County Historical Society in Sedan have several newspaper accounts that tell his story. After realizing that it was Jeff Duree who had escaped the Cloverdale shoot out, many thought that he had been wounded and probably didn’t survive the trek through the hills. However, there was much confusion concerning his whereabouts. This article appears in the October 9, 1924 edition of The Grenola Leader. By this time his Duree’s wife, Hattie, was very sick with tuberculosis, first he took her to Radium Springs seeking treatment then to Arizona, where they bought a farm and raised chickens. They lived a quiet life there, except for being absent for brief times to raise funds. He became a Sunday School teacher and even helped build a church. It was during this time that lawmen in Oklahoma arrested many of the middlemen and accomplices. Duree’s mistake was mistake when he returned to Oklahoma City to visit a bondsmen and was spotted and tracked by U.S. Marshall Alva McDonald. Phoenix Arizona, May 9 Jeff Duree, the last of a string of notorious Oklahoma bank robbers, was ensnared in the law’s net yesterday—but not as the dangerous, ruthless outlaw whose reputation caused him to be both feared and sought throughout the southwest. Found as a tiller of the soil on a small ranch at Roosevelt, near Phoenix, Duree, who is sought on suspicion of robbing several Oklahoma and Kansas banks, meekly submitted to the law and today he is a prisoner in the Maricopa county jail. The former bandit has found refuge since last December in the seclusion of his ten acre tract, where his ranch neighbors knew him as “Joe Wilson, farmer”. There it is said, he lived peacefully with his wife and two children until yesterday, when the law called for the reckoning. Duree faces a twenty-five year sentence in Oklahoma for alleged participation in a robbery at Emund, on Sept. 28, 1921. He jumped a $10,000 bond last November, after his sentence had been appealed and affirmed. He also is wanted in Kansas in connection with the robbery of a bank at White Water. Arresting officers found Duree unarmed. He offered no resistance when he was handcuffed. No statement was made and he was taken in to Phoenix, where county authorities turned him over to the custody of Department of Justice agents.” From the Winfield Courierin theThe Grenola Leader, Thursday May 14, 1925. According to most sources, Duree was returned to Leavenworth to finish his 25 year sentence. But by then people in this area didn’t know what to believe and the robberies continued. Below is part of a story that appeared in the Grenola newspaper in 1926. “The burglars gained entrance in the Cloverdale store by whittling a hole through an egg case cover that had been nailed over a broken pane of glass near the door latch which enabled the lock to be reached and opened from the inside. They took only groceries consisting of canned goods, lard, coffee and a quantity of ammunition. The cash drawer was not molested. In 1927 an article appeared in The Grenola Leader telling that George Duree and other unknown persons had robbed the Conway Bank at Conway, McPherson County, again George escaped.
. Jeff Duree was in prison when his wife died in January of 1934. Her funeral was held at the Methodist Church in Grenola. Mike Arbuckle remembered that he was singing with a group of young men at the funeral. He would never forget the sight of the famous outlaw, accompanied by Federal agents in handcuffs and leg shackles. Jackie Russell has posted the following information on the Internet. My husband, Jim Sweet, remembers this incident, he believes to have happened in the Spring of 1958. He was living with his parents before entering the military service. One evening they were sitting out on the front porch of their home on the edge of town when they say a stooped figure walking down the lane. “ Well, if that isn’t Jeff Duree!” exclaimed Floyd. Mr. Duree was very polite and charming. He asked if he could have a bite to eat as he had been walking all day. He had tried to visit his former brother-in-law, but they wouldn’t even open the door to him. So Blanche prepared some food for him, he ate on the porch, then asked if he could stay the night, promising to leave early the next morning. Warily they let him sleep in the garage, probably providing him with a cot or something comfortable to sleep on. He thanked and praised them profusely for their hospitality. Next morning, true to his word, he was gone. That evening, back he came driving a brand new Chevrolet, and wearing a new three-piece suit. He stepped out of the car and pulled out an expensive new fishing pole. He thanked them again for their hospitality and told them he wanted them to have the pole in appreciation of what they had done for him. He waved goodbye on the way down the lane in his shiny new car. Floyd never touched the pole, except for pushing it back out of sight under the front porch. Even though he would rather fish than eat, he was sure the pole was stolen goods. Years later when they built a cement floor or the porch, the pole was left buried under the cement. They heard later about the robbery at the supermarket. It didn’t take long to learn that Mr. Duree had gone to Moline, opened an account at the Bank and written a check for a new suit and fishing pole at the Moline Mercantile. Going on to Ames Chevrolet, he wrote another check to pay for the new car. That was Jeff’s last appearance in Grenola.
. According to sources on the internet, Jeff Duree died of a stroke inside the walls of Lansing Penitentary on June 27, 1961, at the age of 68 and is buried in an unmarked grave at Mt. Muncie Cemetery in Leavenworth. Saturday afternoon about 2:30 parties living near old Canola school house noticed smoke issuing from the flue and windows in the house and hurried to the scene but when they got there and bursted the doors open the smoke and heat from the inside was so intense that they could not save anything at all, and had to just stand off and watch it go down in ashes. When the parties who first noticed it arrived the fire was just breaking through siding at the level of the floor at one end of the house and the whole interior seemed to be burning but the smoke was so thick inside they could not see anything. This was a very good school house and contained a fine library of over 50 books, a good organ and nice furniture and fixtures, not a piece of which was saved. There was $450 insurance on the building and $50 on the contents. The insurance will no where near replace the loss. Have not learned whether they will rebuild at once or not, but it is presumed they will. Caption for photo. 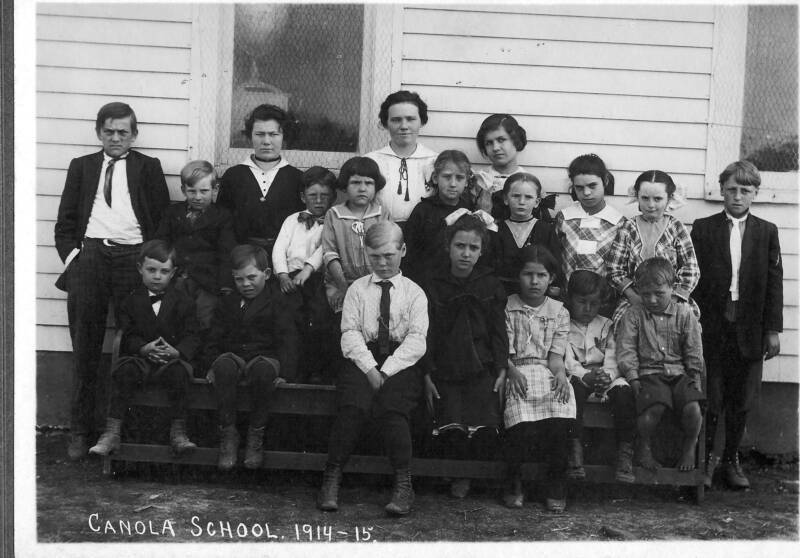 This picture is of students and teacher at the Canola School in 1914-15. Left to right Front row: Lloyd Jordan, Merle Jordan, Bennie Weaver, Hester Self, Lucille Depew, Albert Depew, Richard Self: Middle row: Beryl Greenwood, Edward Pinegar, Gertrude Depew, Mae Self, Opal Stiles, Marie Stiles, Fern Jordan, Willard Self; Back Row Garret Stegelman, Olive Weaver, Stella Crowther, teacher, Ruth Depew. 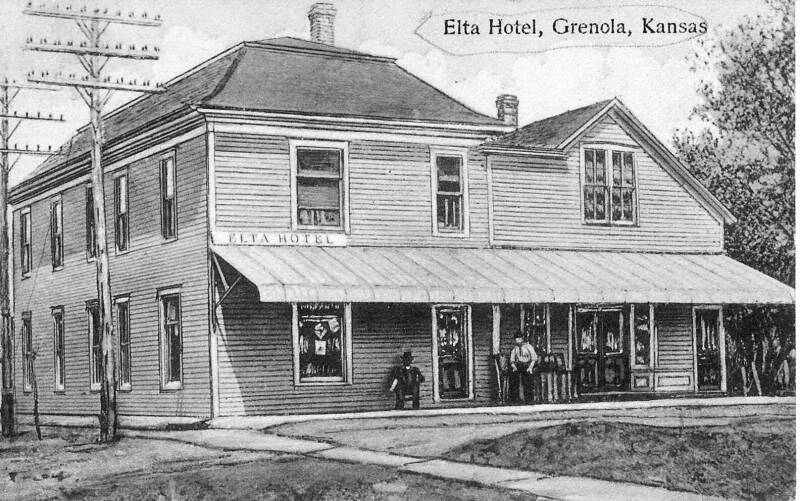 The Elta Hotel was built in 1909 just north of the railroad track on the east side of Main Street. It belonged to Captain James Best, Captain of a Mississippi Steam Boat. His home had been on the east side of that block, they moved it across the block and made several additions. James came to Grenola "on Leave" from the riverboat, I suppose he caught the train from Kansas City. His wife had died shortly before he began the hotel. The Grenola Leader, July 22, 1909. The original plat of Grenola was deeded and named after William H. Guy. His obituary appeared in the Grenola Greeting and Chief, Friday, October 10, 1902. Those who live north of Mulberry Street find that their property is part of Gunn’s Addition. From the Grenola Greeting, Friday, Feb. 22, 1901. “Major O.B. Gunn died at Kansas City February 18, 1901 of stomach trouble. Major Gunn was known as a great civil engineer. He built a great number of railroads and was chief engineer in the construction of the Southern Kansa Rail Road and the Union depot at Kansas City. He laid out two additions in Grenola and has been identified with Grenola in other ways for twenty years. He built the opera house here, which is now owned by Mr. Aubuchon. 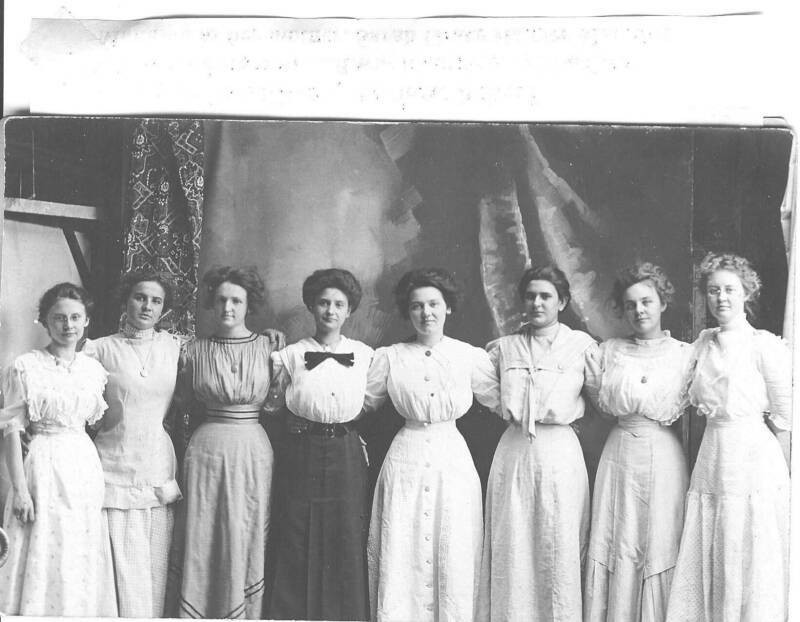 Caption for Picture: Left to right: Josie Riley, Ethyl Payne, Mary Standwood, Opal Logsdon, Maude Shaff, Nellie Hamill, Grace Root, and Mrs. Elvis Underwood. ALBERT LOGSDON, farmer. P. O. Grenola, was born in Hart County, Ky., 1826, where he was raised and lived until 1870, when he migrated to Kansas and was one of the early settlers in Howard County and took a claim on Section 6, Township 31, Range 9, this being before the survey was made, and was eighty- five miles from a railroad. His place contains 320 acres of land, well watered by the Caney River, with five or six acres of timber, making a fine place for stock, which he is raising to some extent; has 100 acres in cultivation and has a very desirable farm, situated but three miles from market. Mr. Logsdon is a good farmer and has many warm friends in this town. Was married, in 1846, to Miss Nancy Fuqua, of Hart County, Ky. They have ten living children, viz. : C. V., A. E., H. A., A. L., S. F., Lovina,. Virginia, Lucy, Nettie and Marcy. DENNIS LOGSDON, farmer, P. O. Grenola, was born in Hart County, Ky., 1833, where he was raised and lived until 1870 and was engaged in farming and teaching. From there he came to Kansas and located a claim on Spring Creek, on Section 36, Township 31, Range 8, Greenfield Township, his claim being the first or second claim taken on the creek in this county. He was over ninety miles from a railroad and it took eight days to make a trip for provisions at that time. He has a splendid farm of 160 acres, 120 acres of which are in cultivation, the whole under fence, a good orchard, fifteen acres of timber, with plenty of running water, good house, 14x28, with wing 14x28, and good stables. Was at the first election held in the county and was elected the first Constable of Greenfield Township. Mr. Logsdon is raising stock and has forty-six head of cattle and raises about the same amount of hogs. Was married, March 25, 1857, to Miss Lydia Ash, of Hart County, Ky. They have six children, viz., Molly J., C. M., Elsa T., Peter, Paul and Frederick. Is a member of the Missionary Baptist Church. M. S. MANWELL, stock-raiser, P. O. Grenola, was born in Chittenden County, Vt., 1826. Was raised there and followed farming and dairying. In 1871, he emigrated to Kansas and took a claim on Section 1, Town 31, Range 8. Paid $2,000 for the right of it. The place is situated on Caney Creek, with thirty acres of timber, making one of the best places in the county for stock. Has 175 acres under improvement a fine orchard of 200 apple trees, the same of peach, and all kinds of small fruits; has a barn 28x50, and sheds for sheep, 18x30, 24x30 and 12x20; house 18x23, with wing 12x16, and is the largest wool grower and cheese maker in the county. Commenced sheep-raising in 1872, starting with about 300 sleep, which have grown to 2,000 head. They are a high grade of Merino and the clip raising from four to eight and one-half pounds per annum. Has seventy-five cows and makes from 1,200 to 1,500 pounds of cheese per annum, besides considerable butter; also raises some full blood jersey cattle for dairying purposes; also owns some other farms and is one of the largest farmers in the County. Was married, in 1851, in Chittenden County, Vt., to Miss E. A. Whitcomb, a native of that county. They have seven children, viz. : S. W., Carrie S., Jennie M., Edward H., Maud G. and Nina. Is a member of the Masonic order. M. S. MILLER, farmer, P. O. Grenola, was born in Essex County, N. Y., 1850; in 1870, emigrated to Kansas and located a claim in Howard County in Section 17, Town 31, Range 9; was among the first settlers in this township; was eighty-five miles from a railroad point, and the first year went to Kansas City, 185 miles, for supplies; at the present time, his farm joins the town site of Grenola, with a railroad within one-half mile; his place is well watered by a branch of Caney Creek; has some timber, making a desirable stock farm; has put ninety acres in cultivation, fenced the whole farm, put out an orchard of about ten acres, put up good frame house 22x16 with wing 14x16, stone barn 20x60, besides sheds, corrals, etc. ; is raising stock - has forty-five head of cattle and about fifty head of hogs, twelve head of horses, and has made the whole of his property here in Kansas. Was married, 1878, to Miss W. Armfield, of Elk County. They have one daughter, Pearl. He is the present Justice of the Peace of Greenfield; is one of the substantial men of the township, and, during the first summer in Kansas, had a hard time. J. G. MORRIS, farmer, P. O. Grenola, was born in Philadelphia, Penn., in 1837, where he was raised until nineteen years of age, when he went to the copper mines of Michigan. The following year he emigrated to Iowa, locating in Butler County, and lived there and in Franklin County thirteen years and engaged in farming. In the spring of 1869, he emigrated to Kansas, locating in Johnson County, and in 1870 come to Howard County. Before the survey was made, located a claim on Spring Creek on Section 26, Township 31, Range 9, and took one of the two first in this part of the town. He has plenty of running water and fifteen acres of timber, making a fine place for stock raising. When he settled here he was 100 miles from a railroad point, and had to go a long distance for his supplies. He has his place well improved - all under fence, forty acres under cultivation and has two acres of orchard, good house and stables. He is engaged in raising stock; has thirty-two head of cattle, and raises from ten to sixty bead of hogs; he has done well, is a pleasant gentleman and neighbor. In 1860, he was married to Miss E. M. Allen, of Franklin County, Iowa. They have nine children - W. L. A. S., Jennie, Eva, Emma, Ettie, Lizzie, John and Addie. R. C. MUSGRAVE, M. D., physician and surgeon, was born in Hamilton County, Ill., February 19, 1834; when seventeen years of age, he located in Jefferson County, remaining there until 1862, when he enlisted in the Eightieth Illinois Volunteer Infantry; serving six months, returning to Jefferson County, he began reading medicine under Dr. Stonemets, and after finishing his course, followed the practice of medicine until 1870, when he settled at Fairplay, Mo., remaining there two years. In 1872, he emigrated to Kansas, locating in Howard County; took a claim in Greenfield Township, now in Elk County, and after living on the place two years, he located at Canola, where he followed the practice of medicine and carried on a drugstore. When Grenola was started, he located there and has had a large practice since. He is the oldest physician in this part of the county, and has been very successful. He was married in 1857 at Mount Vernon, Jefferson Co., Ill., to Miss Zilpha A. Green. They have three children - Cora A., Robert G. and John D. He is a member of the South Kansas Medical Association. LIEUT. D. M. REID, Postmaster, was born in New York City in 1816. In 1859, he located at Macomb, McDonough Co., Ill. He enlisted, in 1861, in the Sixty-fourth Illinois Volunteer Infantry Sharpshooters, serving until the close of the war, coming in as a private, and was discharged with a First Lieutenant commission; also served as Assistant Commissary of Subsistence and Post Quartermaster and Disbursing Officer at Ottawa, Ill. and Glendale, Miss. ; had contracts for furnishing beef, etc. ; held other important positions while there. After coming out of the army, he engaged in farming near Macomb until 1877, when he emigrated to Kansas, located in Canola, Howard County, and took charge of a drug store; was appointed Assistant Postmaster soon after, and Postmaster in 1879; he became a member of the Grenola Town Company, of which he was a prime mover, assisted by Mr. Hawkins and Mr. Guy, and June 7, 1879, organized the company with 100 shares. At the first meeting, the following officers were elected: Thomas Hawkins, President; W. H. Guy, Treasurer; D. M. Reid, Secretary; Directors, R. C. Musgrave, William Dory, R. A. Bowden, J. R. Fletcher. Mr. Reid has been Secretary constantly since, and has done the greater part of the business. Maj. O. B. Gunn, of Kansas City, has been an active member of the Company, and is now owner of a majority of all the stock of the company. Mr. Reid moved to the present town site of Grenola, and succeeded in locating the post office here and received a commission as Postmaster. The town site of 160 acres on Section 17, Town 31, Range 9, was laid out into 30 blocks, and in July, l881, 16 more blocks were added. Mr. Reid has disposed of about three-fourths of the lots for the company. The members of the company are all thorough business men, the most of them having invested largely in building and business enterprises in the place. The present officers are M R. Reeves, President; R. A. Bowden, Treasurer; D. M. Reid, Secretary and selling agent; Directors, O. B. Gunn, R. A. Bowden, Thomas Hawkins, M. R. Reeves, William Dory and D. M. Reid. Besides the business of the poet office, which is one of the largest distributing offices in Southern Kansas, and the business of the Town Company, Mr. Reid is serving as Township Clerk of Greenfield Township, and Town Treasurer of Grenola, serving the second term in each. Mr. Reid is a courteous gentleman and a thorough business man, and Grenola owes a great deal to his enterprise in being the best business point in Elk County. R. W. M. ROE, Chairman of Board of County Commissioners, was born in Bath County, Ky., 1848, but was raised in Kirksville, Mo. In 1864, enlisted in the Sixty-fourth Illinois Sharpshooters, serving eighteen months. After coming out of the army, located in Champaign County, Ill. In 1866, emigrated to Kansas, first settling on the head of Elk River, Union Centre Township, 1869, took a claim in Union Centre Township; was one of the first settlers there; improved this claim and lived on it ten years; was 150 miles from market, drawing his first supplies that distance; salt was worth $13.50 per bbl., bacon 35 cents per lb., and it took thirteen days to make a trip to mill. Was Trustee of Union Centre Township; was a delegate to the first county convention held in the county. The land was not surveyed when he took his claim. In 1879, sold out and located at Grenola, and started a nursery, the first enterprise of the kind in the county; has 7,000 apple trees, 100,000 osage hedge, a large amount of cherries, plums, peaches, grapes, quinces, etc. ; besides these he is handling a full line of ornamental shrubbery and forest trees, and a large variety of fruits for other nurseries. In 1880, was elected County Commissioner of Elk County, for a term of three years, and is the chairman of the Board of Commissioners at present, which position he has filled with entire satisfaction to the public. Mr. Roe is one of the most enterprising citizens of the County, and has always been an active part in the politics of the county and public enterprises of all kinds; is a thoroughly reliable man and has a host of friends, both of the old as well as new settlers in the county. Was married in 1867 to Miss Mary E. Sullivan, of Illinois. They have six children, viz. : Wesley, W. T., C. W., Massena, Sarah M., Lily. Mr. Roe is a member of E. M. Stanton Post, No. 23, G. A. R; Grenola Lodge, No. 86, A. O. U. W.; is Grand Master of the Lodge, and a Representative of the Grand Lodge. M. E. RUGGLES, farmer, P. O. Grenola, was horn in Broome County, N. Y., in 1826. In t835, he emigrated to Michigan, locating in Oakland County in 1856, located in Waupaca County, Wis., remaining there four years, then back to Oakland County, remaining there until 1870, when he emigrated to Kansas, locating in Elk County, then Howard, taking a claim, before the survey was made, on the southeast quarter of Section 8, Town 31, Range 9; was seventy-five miles from a railroad, and no improvements to be seen. He has fifty-five acres improved; the place all fenced and a fine orchard of 900 peach trees, 100 apple and other fruits of various kinds; there is plenty of water furnished by Caney Creek. He was Justice of the Peace the first three years after the county was organized, and is the present Township Treasurer. He is raising sheep of a high grade of merino, and gets an annual clip of eight pounds per head, the investment paying forty per cent. He was married in 1854 at Milford, Oakland Co., Mich., to Miss Hattie Billsen of that place. They have two children - Frank E. and Mary E. He served from the spring of 1865 until the close of the war in the Twenty-second Michigan Infantry. JOHN W. THOMPSON, farmer and stock-raiser, P. O. Grenola, was born in Belmont County, Ohio, in l832, but was raised in Tuscarawas County. In 1856, he emigrated to Madison County, Iowa, where he was engaged in farming and stock raising. In 1872, he came to Kansas, locating in Elk county (then Howard), and bought a farm of 160 acres in Section 32, Township 31, Range 4; has since added 160 acres, making a farm of 320 acres, on the Caney River, two miles south of Grenola; has plenty of nice running water, with forty acres of timber along the banks, making a fine place for stock; has 170 acres in cultivation, with a good orchard of 100 apple trees, 150 peach, and small fruits; has a fine stone quarry on the place, with good stone for making lime; was fifty miles from market when he settled here; is raising considerable stock; has served as Assessor and Trustee of his township, and one term as County Commissioner; was married, in 1857, to Miss Sharp, of Ohio; they have six children, viz., Charley, Franklin, Ruth, John W., Jr., Newton and Milton (twins); is a member of the Methodist Episcopal Church. HON. ELI TITUS, was born at Lebanon, Ind., July 16, 1846. That was his home until he was seven years of age, when his parents removed with their family to Galesburg, Ill., where he resided until his location in Kansas in the spring of 1867, settling at Paola, Miami County, where he remained until the fall of l869, going then to Erie, Neosho County. In January, 1870, he located at Cedar Vale, Howard County. Served two terms as Sheriff of that county. He was, extensively engaged in cattle dealings there. In January, 1882, he removed to his present home in Grenola, Elk County. In the fall of 1882, he was elected a member of the Legislature, serving in the Kansas House of Representatives during the session of 1883, and was a member of the Railroad Conference Committee which prepared the report which was adopted by both branches of the Legislature. He proved himself to be a valuable member of the House, and his untiring efforts to secure such legislation in regard to all matters as should prove for the best interests of Kansas have been appreciated. His constituents cannot fail to recognize his fidelity to their interests. Mr. Titus is associated with E. M. Hewins in cattle and mercantile business. They are among the most extensive dealers of cattle in the country. In 1882, they handled about 70,000 head, shipped to the market 40,000 of that number. They have now on their ranch in the Indian Territory 28,000 head of cattle. Their principal transactions are in Texas, Indian Territory and Kansas; Mr. Titus being also a stockholder of the Stock Exchange Bank at Caldwell, Kan. Mr. Titus was married in Connersville, Ind., October 4, 1869, to Lillie Myers, a native of Cincinnati, Ohio. They nave three children - Harry and Carrie (twins), and Myrtle. Mr. Titus is a member of the A., F. & A. M. and A. O. U. W.
GEORGE WALKER, stock-dealer, P. O. Grenola, was born in Cheshire, England, in 1819. In 1845, he emigrated to America, locating in Des Moines, Iowa, where he engaged in farming in 1877, he went to Illinois, remaining there four years, coming to Kansas in the spring of 1871, locating in Howard County (now Elk); took a claim on Section 12, Township 31, Range 9; has about 720 acres of land in the farm, well watered by Caney Creek, and timber enough along the creek to shelter his stock. He has 100 acres under cultivation, 160 acres fenced, and the balance is pasture; has planted a good orchard and put up a good frame house 18x23, with a wing 17x18, barn 32x40, with a basement full size, with a good wind mill. Besides the home farm, he has 280 acres south of Grenola, with 100 acres under the plow, ten acres of timber, well fenced, two good houses, and other improvements. Mr. Walker is raising considerable stock; has 200 head, and besides twenty-five cows for dairying; also raises a great many hogs. Mr. Walker is one of the most successful farmers and stock-raisers in the county. He was married in May, 1865, at Burlington, Iowa, to Miss Charlotte Darbyshire, a native of London, England. They have two children - John Henry and Robert H.
M. V. YANCEY, M. D., was born in Mount Pleasant, Henry Co., Iowa, in. 1858. He was raised there, and took a course at the high school of that place. In 1874, he emigrated to Kansas and located at Chautauqua County, remaining there three years, on the farm with his father; thence, in 1877, to Emporia, where he attended the State Normal School. At the end of one year, he located at Howard, Elk County, and read medicine with Drs. J. B. Lewis & Son, and in the fall of 1879 he went to Chicago and finished his course at the Bennett Eclectic College, and graduated in the spring of 1881. He then returned to Kansas, locating at Grenola, where he commenced the practice, and has remained there since, enjoying a lucrative practice. In 1881, he was united in marriage with Miss Margaret F. Miller, of Battle Creek, Mich. They have one daughter - Mary. He is a member of Grenola Lodge, No. 86, A. O. U. W., and is the examining surgeon; is also a member of the State Medical Society. 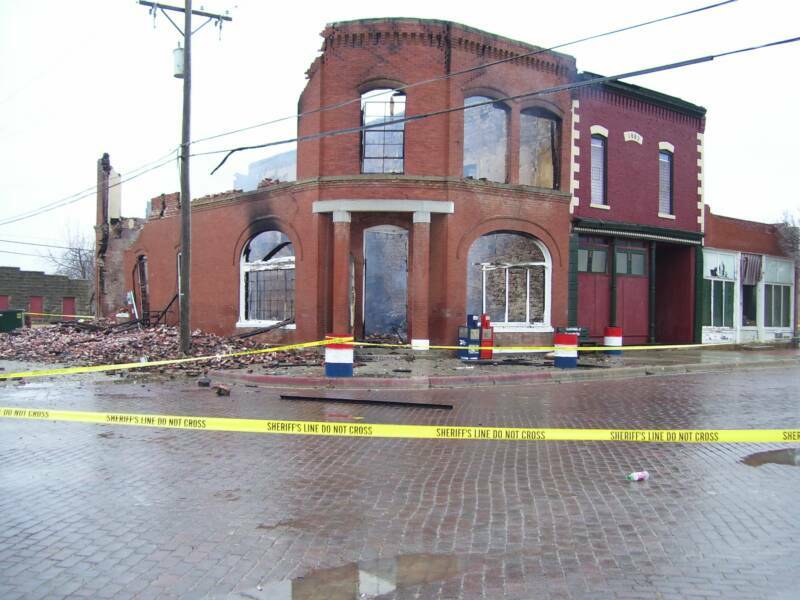 Tragedy Hits Grenola's Historic State Bank Building December 2007 by Fire!